The Industrial Laundry Monitor (ILM) determines the degree of wear of textiles as a result of the washing process. 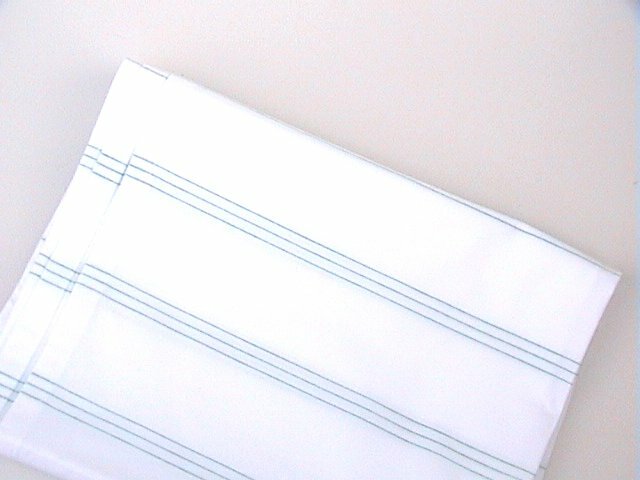 It is a cotton cloth into which green wires strips are woven. The monitor is washed 25 times and then analysed by us. We examine the chemical abrasion (loss of tensile strength and the degree of damage), ash content and whiteness in artificial light and daylight. Want to learn more about the Laundry Industry Monitor? We will happily give you details and notes on the analysis and instructions. The Industrial Laundry Monitor is a monitor specially developed to determine the loss of strength due to the washing process. Besides, a number of extra analyses can be performed. A high total wear during the washing process is often not noticed or noticed too late. High total wear increases costs because laundry is worn-out quicker and therefore has to be replaced sooner. To be able to check the total wear which appears during the washing process, the wear must be measured. For this purpose the Industrial Laundry Monitor (ILM) can be used. Besides determination of total wear (a combination of mechanical and chemical wear), the chemical wear, ash content and whiteness in artificial light and whiteness in daylight can be determined. The monitor consists of a (white) standardized cotton cloth. The cloth is divided into strips by in woven green threads. This division is necessary for the various analyses. Performing the test is very easy. The monitor has to be washed 25 times (optionally 50 times) with the washing process to be tested. Each cycle must take place with the same process and same type of laundry. The cloth must be washed without ironing or drying in between. If desired the cloth can be air-dried in between two cycles. The number of cycles can be registered on the enclosed form. After the last cycle the cloth has to be dried. After drying the cloth can be returned and then we will perform the agreed analyses. The total wear is determined by measuring the loss of tensile strength. This is a combination of the mechanical as well as the chemical wear. A high total wear will be found when, for example, the water levels are too low, but also with special processes with high mechanical and chemical action. Also the total wear can be too high solely due to high chemical wear. The chemical wear is determined by establishing the average chain length of the cellulose, the degree of polymerisation. The result is expres sed in the damaging factor, which is linear with the chemical wear. Chemical wear is caused mainly by unfavourable bleaching circumstances. These can be caused by, for example, a too high concentration of bleaching agent, wrong pH value, wrong temperature, iron present in the water etc. The ash content is determined by ashing the cotton. The ashes, which remain, will be weighed and calculated on weight bases. When hard water is used for washing, or when rinsing is insufficient, the ash content will increase. If high ash content is found, the cause might be e.g. problems with the water softener, insufficient rinsing etc. When the whiteness is too low, this can be caused by greying. This greying can occur when rinsing is not done sufficiently or when the detergent concentration is too low. Besides whiteness in artificial light, the ultraviolet (UV) component is determined too. The optic brighteners present in detergents turn UV-light into visible light. In daylight this gives an 'extra' white impression. This effect is measured. The monitor is sealed in an airtight vacuum package. This package also prevents light from entering. This way the quality of the monitor is guaranteed. As usual with all our test materials, the monitor is delivered with instructions for use and a form to fill in. On this form the number of cycles, the machine type and the tested process can be recorded. This will be used by us to fill in the results form.